The vertical bars show recessions as determined by The National Bureau of Economic Research (NBER). The graph is the Consumer Expectations Index, compiled by Conference Board. 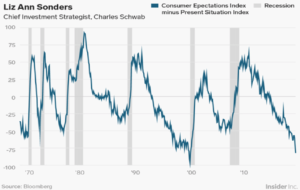 The Expectations Index reflects consumers’ short-term — that is, six-month — outlook for, and sentiment about, the anticipated income, business, and labor market conditions for a given region. Rarely does an indicator of economic activity hold the reliability that the Consumer Expectations Index does. When the Indicator hits lows, recessions follow. Only trouble is, just how low does the Index have to fall before a recession sets in? A reading of -50 preceded five recessions; yet the Index had to fall to -100 before the year 2000 recession. Currently, the Index is about -80. Perhaps the governors of the Federal Reserve are monitoring this index as they suspend rate hikes, talk about capping interest rates and slow the reduction in the nearly $5 trillion of assets that they bought 2008-2015—with money created out of “thin air.” That money printing kicked a major bull market in the metals. Perhaps the Index is what gold investors are watching as they hold the price of gold above $1300.